The short story that follows was received by your Editor on 23 February 2007, along with pictures of the scuttling of the German Battleship Graf Spee. 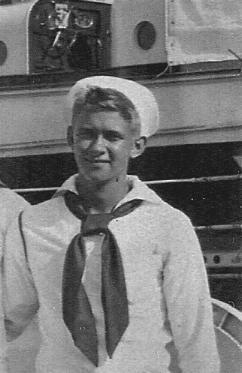 What are the odds of a sailor from your hometown, a childhood friend, reaching out his hand to help you aboard ship after you'd been sunk in the South Pacific 6,000 miles away from home? That's exactly what happened to me. My name is Joseph Desch, and that sailors name was Eli Vicero. Eli was an Italian kid I met at St. Peters Catholic School in Columbia PA., in 1926. Columbia was a town where everyone knew one another and stayed close. But during my childhood my family frequently moved in and out of Columbia, as my father was a railroader. Every time I came home, however, I would spend time with Eli. We would fish in the Susquehanna River, play baseball in the gravel lots, and swim off the 7 Pier, a favorite swimming spot in town. I joined the Navy in 1939 and after boot camp I was sent to the USS Helena CL50 in the Brooklyn Navy yard, loosing touch with Eli. On July 6, 1943, the USS Helena entered the Kula Gulf to engage a Japanese navel task force. Three torpedoes from a Japanese destroyer hit the Helena, one in the bow, the second amid ship, and the third in the fantail. In 20 minutes the Helena was gone. After hours in the water our rescue ship arrived, the DD446 Radford, and I swam to her along with Henry Brunkhardt who was the Pointer in the Helena's Forward Director. As I approached the ship a cargo net was thrown over the side for the sailors to come aboard. Near exhaustion, I made my way up the net but could not muster the strength to pull myself over the foot line and in to the welcoming arms of the Radford. At that very moment, like a guardian angel, a sailor said, "can I help you sailor," and grabbed me by the collar of my life jacket and my belt and pulled me aboard. I instantly recognized the voice of Eli Vicero, my boyhood friend from Columbia, PA.
After the ordeal at sea I spent months at St. Alban's Hospital in New York and was then sent to the Willow Grove Air Station, in Willow Grove PA, as a Master Arms for the base. While making my rounds one day at the base garage, who emerged from under the hood of a military truck, none other than Eli Viscero. Since that day our friendship never faltered. Years later when Eli's wife needed blood a group of sailors and I went to Temple University Hospital to donate. We filled quite a bit of her blood bank. In 2002, my lifelong friend Eli Vicero died. I miss him very much. Despite the void created by his death, I will never forget Eli and the bond we rekindled on that cold South Pacific July night or the enduring friendship we enjoyed for many years afterwards. To see Joe's Collection, click HERE. To see Joe's pictures of the Graf Spee, click HERE. To see a picture of the Graf Spee before she was scuttled, click HERE.